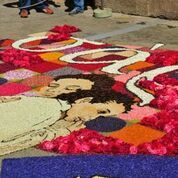 On June 2nd and 3rd 2018 the artistic Infiorate of Corpus Domini return to Spello, which for artistic and technical quality (only vegetal elements, no glue or artificial colors) dimensions (from 25 to 70 square meters and at least 15 square meters the carpets), they have become the best known and appreciated infiorate in the world, attracting over 60 to 100 thousand visitors and tourists in a weekend. The most interesting moment is the Night of Flowers, the "night vigil" which, in the night between Saturday and Sunday, actively involves all the families and groups of Spello, about 2,000 people of all ages, including almost 500 children, in the realization of almost 2 km of wonderful carpets and floral paintings along the medieval streets of the village. In 2018 the highlight will be on the weekend of 2-3 June, but already from the week before the city will start to animate with many free events to admit that frame the event: exhibition of sketches and exhibition of floral embroidery at the Museum of Infiorate, exhibitions of painting and photography, floral embellishments of "Windows, balconies and flowered alleys". On the weekend of the floral decorations live music, floral menu in the inn of the infioratori, night-time guided visits to art sites and floral carpets, shuttles from car parks and camper parking areas, floriculture market exhibition in public gardens and restaurants and shops open all night until dawn ... During the "Night of Flowers", while the infioratori work on the ground protected by structures that will be dismantled at dawn, visitors and tourists can watch, talk and even participate in the Infiorata of tourists , actively collaborating in the most characteristic phases of the event, from the preparation of the petals to the composition of the paintings on the pavement (but also to the collection for those who will be in Spello already in the previous days). On Sunday mornings, before 8.00 am, the works will be completed and after the jury evaluations the Corpus Domini procession led by the Bishop will trample them, recalling the ephemeral sense of their beauty and closing an experience of the highest human, artistic and religious value. 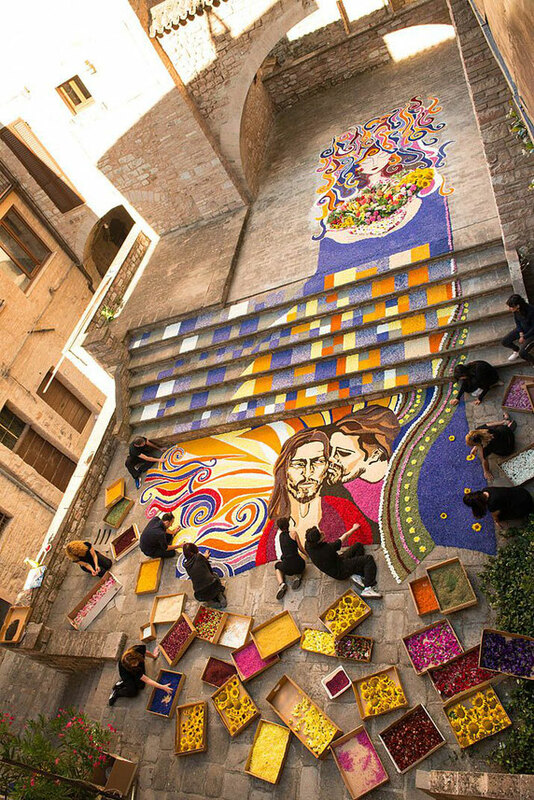 Every year in Spello, on the occasion of Corpus Domini, from 1500 to 2000 meters of floral rugs and paintings are created, inspired by religious motifs. The custom of honoring the divinity with throws of floral material or the creation of floral compositions on the ground is lost in the mists of time in many places, but in Spello this tradition, which was channeled into throwing, then put artfully on the roadway vegetable elements , is documented in the Archives of the City for the first time in 1831. On the occasion of the visit of the bishop Ignazio Cadolini who was to take possession of the city, October 19, 1831 was requested by the gonfalonier Francesco Nicoletti to all the inhabitants of the houses that overlooked on the main road, for which the procession with the high prelate would have passed, to keep for the day well cleaned, and free from any rubble, the respective stretches of road facing the houses and to scatter in copy of the flowers or vegetables [ ...]. The iconographic testimonies relating to the floral decorations in Spello date back to the early 1900s: Benvenuto Crispoldi (1886-1923), painter and mayor of Spello, depicted in one of his paintings the passage of the Corpus Domini procession on the infiorata. In a short time Spello took up the artistic composition of the flowered carpet that transformed the feast of Corpus Domini on a joyous occasion in which all families and then more and more experienced groups of infioratori could compare their work and reward those judged best for skill technique, precision and creativity. Inside the exhibition of the works of the hand embroidery competitions "Il Fiore Ricamato e ..."
Kick Off! Assembly of marquees for the realization of the infiorate, between music and tasting of beerEtica with elder flowers. Inauguration of the XII Market Exhibition of Florovivaismo "Spello in Fiore"
CONTINUES THE NIGHT OF FLOWERS ... MUSIC, EXHIBITIONS, MUSEUMS, SHOPS AND OPEN BARS ALL NIGHT !! 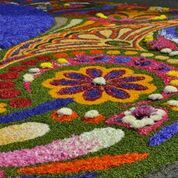 INFIORATA OF THE TOURISTS: In the historical center an area will be entirely reserved for tourists and visitors who want to try their hand in the realization of an infiorata, with the support of historical infioratori. An infiorata for children will also be set up. The marvelous Infiorate that visitors find themselves to admire are the result of a complex and difficult job that requires weeks and even months of patient work by many people. Among the most important and demanding preliminary stages of the event are the research and collection of flowers and then the selection and conservation of the petals. 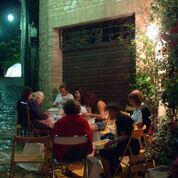 In the days before the "Corpus Domini" there is a real general mobilization: nourished teams of Infioratori are dispersed along the slopes of Subasio and in the Umbrian valleys and other citizens spend evenings on the fresh ground floor, separating the petals according to the colors and finely chopping fragrant herbs. On the eve of Corpus Domini, from the early afternoon, the streets of Spello interested in the process of the procession are closed to traffic. Appropriate lighting systems are set up and provision is made to set up rain and wind protection systems on the affected road sections, to prevent adverse weather conditions from affecting the work of the Infioratori. Then, with various techniques, you start to perform the design on the road surface, not subject to any treatment. And finally we proceed to deposit the petals. The works last the entire night and at 8 am the streets are covered with a long polychrome and fragrant carpet: a unique sight to behold. Just think that in a single floral path, 60-70 Infiorate among carpets - each of 12 to 15 meters in length, with a minimum surface of 15 square meters - and large paintings - from 25 to 70 square meters are made. The uniqueness of the Infiorate character is given by the technique of execution, which involves the exclusive use of plant elements not treated with chemical or preservative agents nor with artificial or pulverized dyes. With the passage of the Sacred Parade led by the Bishop, an experience of the highest artistic and human commitment ends. In fact, the different stages of Infiorate actively involve about two thousand people: from the child who collects the flowers, to the pensioner and the artist who with admirable trait reproduces the Madonnas of the Umbra School, the Angels of Giotto or the sweet figures of Botticelli. When the procession flows on the beautiful floral decorations on Sunday, the religious purpose is reached. The precious flower carpets can now be trampled by anyone. Their ephemeral glory has come to an end, to its natural epilogue. 2. The infiorate can not be less than 12 meters long and must be at least 1 meter far from the edges of the road, to facilitate the passage to visitors. 3. The drawing can be drawn on white paper only in the figurative parts, provided it is not colored. 5. The infiorate must finish by 8.00 on Sunday. 6. Only works with a religious theme are taken into consideration for the award ceremony. 7. There will be two juries, one composed of 5 members experts in artistic, architectural and theological disciplines that will evaluate the Quadri category, and one with 5 infioratory masters chosen by lot to evaluate the Carpet and Under 14 categories. The preparation of the infiorata is the most interesting and lively phase of the event: it begins in the early afternoon of Saturday - with the preparation of the protections and with the creation or reproduction of the drawings on the sections of the roads assigned to each group - and continues all night long, when the inflorescents place the petals on the drawings with the utmost precision. The floral species used in the infiorate are very numerous: cornflower, rose, carnation, poppy, fennel, vetch, iris, broom, elder, daisy, tarassico, thistle, serputello, planzago, viscaria, sage, linaria, calendula, anemone, cicirilli, magnolia , cipollone, gaggia, fig, oak, walnut, cypress, pine, wild orchid. 1. The first design phase takes into account the available road surface, in order to allow the study of the subject and the colors. 2. The second phase is that of combining the colors of the sketch and the flowers available. 3. The third phase is the gathering of flowers, which takes place in several periods, even a few hundred kilometers from Spello (mostly between Mount Subasio and the Umbrian-Marche Apennines). 4. The fourth phase of the flowering (or "capatura") of the flowers consists in the separation of the petals by type and color. 5. The fifth phase is the preparation of the drawings on white paper, but not all the groups perform it, some draw the sketch directly on the road. 6. The sixth phase is that of the preparation of molds that facilitate the work of composition with the petals. 7. The seventh phase is the installation of awnings or other roofing systems that protect the works against rain and wind and other adverse weather conditions. 8. The eighth phase, performed on Saturday afternoon, is that of the gluing of the executed design (with wallpaper glue). 9. The ninth phase is the composition of the drawing with petals and vegetables. The settlement operations last from the late afternoon of Saturday throughout the night until about 8 o'clock on Sunday morning, before the jury passes. f about 2 thousand spellani involved in the preparation and implementation of the Infiorate of Corpus Domini almost 500 are children and young people under 14 years. PRIDE TO PARTICIPATE. The commitment of children of all ages is truly amazing. Like the big ones, they remain bent on the ground for almost 12 consecutive hours, selecting minutely the shredded flowers, separating them according to the colors and depositing them on the road surface. Light, minute, agile and elastic like contortionists, very young people often have the task of taking care of final touches of carpets and paintings. Among festive shouts, music and joy ... what is most striking is that even the little ones know that it is not just a game and they are committed with the pride of those who are aware of doing something important for the community and the artistic tradition of the city. Capable of reinterpreting religious themes and human solidarity with great originality and freshness, to the younger artists of Spello, the future Infioratori Masters is reserved a special role so that special prizes and markings are foreseen within the annual Infiorate Competition (Category " Under 14 "). THE ACADEMY OF BUDGETS & STUDENTS IN FLOWER. In order to guarantee the future of infiorate, which is in the hands of the new generations, from 2013 the city of Spello can boast also the presence of a group of baby-infioratori of the Infant School of the G. Ferraris Institute of Spello. It is the Academy of the buds, a start-up group at the infiorate that is supported by the Association in all the activities of preparation and realization of the infiorata. From 2016 the Infiorate can also count on the contribution of a new group of young infioratori: the Students in Flower of the Secondary Secondary School of the G. Ferraris Institute of Spello. THE AUTHOR KNIT. On the initiative of the DieciNove microbrewery in recent years, the author's shirt is made, designed each year by a different artist, which becomes the official shirt of one or more groups of infioratori of the schools. LICEI AD ARTISTIC ADDRESS. A true expression of art, with a technical as well as religious and socio-cultural value, the Infiorate di Spello have opened in the last five years to artistic high schools, which can find in the floral decorations an original way to experiment alternative forms of art in which to express their potential. The students of the Bernardino di Betto high school in Perugia and the "Guglielmo Marconi" high school in Foligno have already participated in the floral display. 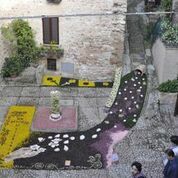 The latter will present this year their infiorata in the Spello territory. INFIORAUTISMO. Since 2015, the Infiorate Association of Spello has kicked off the "Infiorautismo" project, in collaboration with the "La Semente" Social Farm (Limito di Spello), which provides for the sowing and cultivation of cornflowers dedicated to infiorate. It is a first step towards an organization that provides for the cultivation of cornflowers and marigolds to support the weakest schools and groups of inflorists, who find it difficult to find the flowers necessary for the realization of their works. About 2,000 spellani are involved in the preparation and realization of the Infiorate of Corpus Domini, of which about 500 are children and young people under 14 years. Every year Spello records between 80 and 100,000 appearances in the Night of Flowers and during the Corpus Domini procession. Over 250,000 visits to the website and Facebook page during the week of the event: including American, Asian and other contacts from Italy and Europe. A hundred tourist buses, about 400 motorcycles and 300 campers in the parking lots and parking areas in addition to cars not susceptible to counts. 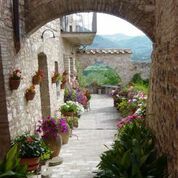 over 1,500 square meters of carpets and floral paintings, the route includes the main streets and alleys of Spello. 60-70 infiorate (and related sketches): 29 paintings (from 24 to 70 sqm), 36 carpets (from 12 to 30 sqm), 13 under-14 rugs. 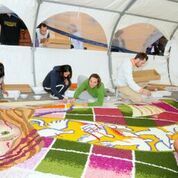 140 square meters is the largest Infiorata measure ever made by the Infioratori di Spello. 3 Infiorate abroad (Bethlehem, Brussels, Lourdes); 12 Infiorate realized in other Italian cities including Rome, Fabriano, Cles, Padua, Milan Expo 2015 ...; 3 infiorata realized for the President of the Republic (Sandro Pertini, Oscar Luigi Scalfaro and the last one, on May 19, 2017 in Spello, for Sergio Mattarella); 1 infiorata realized in Rome next to St. Peter's Square for the 5th International Congress of Effemptive Arts 2014; 3 Infiorate for Pope John Paul II and 2 infiorate realized for Pope Francis in Assisi (the last one in 2016 in front of the Basilica of S. Maria degli Angeli). Over 1,300 members prepare and coordinate works of flower decorations. 15 are the prizes for the Quadri category, 3 for the Figurative Carpets category, 3 for the Geometric Carpets category, 5 for the Under-14 category and 9 for the special prizes awarded by their own jury. The winner is awarded the Properzio Trophy (bronze statuette), which will keep and deliver to the new winner of the following year's competition! 2 Infopoints in the historic center of Spello available to tourists; about 50 shops in the historic center open during the night of the flowers; about 85 volunteers have been on duty from Saturday to Sunday, providing information and regulating visitor traffic, according to precise road conditions. About 6 parking places made available to visitors and 2 parking areas reserved for campers. Floral Menu in the Inn of Infioratori. Menu dedicated to the cooking of traditional foods accompanied by the scent, the color and the charm of the flowers. "Etica", the official beer of the Infiorate. Craft beer flavored with 100% ethical elderflower flowers, produced by Microbirrificio DieciNove di Spello, back in Spello. Beer tastings in the Inn of Infioratori, in the brewery (Via S. Angelo 12) and in some restaurants and bars in Spello. Located in the historic center of Spello (Pg), the "ethical" DieciNove Microbrewery was born from the consolidation of relationships with the social cooperative Utopia2000 and is characterized by the employment of disadvantaged people, mostly young people who are in the community, and for a series of collaborations aimed at building an ethical chain for a 100% ethical product The products were insured with an ethical insurance consortium, the premises were wired by telephone with the first non-profit telephone operator. tasting room are produced monthly about 18 hectoliters of beer flavored with the so-called "forgotten fruits" in three 600-liter barrels.The product is not pasteurized or filtered, refermented in the bottle to maintain the "raw" properties of beer, and is not added no type of preservatives.The production operations are manual. It is one of the most successful initiatives of the last few years! Along the path of the infiorate will be set up an area entirely reserved for tourists and visitors who want to try their hand in the creation of an infiorata, with the constant support of some historical masters of the petal, between music and convivial moments. Even the children of tourists will be able to create a flower bed of their own in the same area. For reservations tel. +39 339-2571653. Exhibition of floral embroidery (Museo Infiorate, Piazza della Repubblica). Exhibition of the embroidery works presented in the contest of the current year and of the works awarded in the past editions of the "Embroidered flower" hand embroidery contest. Called on the occasion of the Infiorate of Corpus Domini, the hand embroidery contest "IL FIORE RICAMATO E ..." wants to enhance an ancient tradition that, through patience and manual skills, continues to express the love for beauty as an element of aggregation between old and new generations. The competition is open to all and each participant can present only one work. The artefact must measure approximately 30x30 cm and must be received by May 13, 2018 by registered mail to the competitor, at the following address: Picchiotti Giovanna, via P.S. Fagotti, 12 / A - 06038 Spello (PG), together with the attached explanatory sheet of personal data and points used. Historical photo exhibition by Cine Foto Amateurs Hispellum Exhibition of vintage photos that tell the story of the floral decorations of Spello from the mid-twentieth century. "Spello, Giardini in fiore", Market Exhibition of Florovivaismo (Public Gardens). Saturday and Sunday, no stop (from 10 am on Saturday until about 9 pm on Sunday) Back "Spello Gardens in bloom", the appointment with all the fans and professionals of the green, organized for the Infiorate of Corpus Domini, gardens that are located at the foot of the beautiful Umbrian village. The exhibition, included in the program of "Le Infiorate di Spello" opens at 10am on Saturday to continue without interruptions until about 9pm on Sunday, enriching the evocative and artistic "Notte dei Fiori" by Spello. Rich and varied is the assortment of typical and quality products from Umbria and other Italian regions: succulents, collectible species and carnivorous plants, the very special tillandsias, pelargonium with fragrant leaves and geraniums in general, orchids and bulbs, rose protee, ornamental and of historical interest, as well as productions and collections of aromatic lavenders. And also, in the field of decorations and accessories for outdoor furniture: handmade production at the time of terracotta, unique and highly original artifacts created by local and non-local artisans. From the car parks to the main access points of the historic center. Ü SPORTS FIELD PARKING - Loc. Osteriaccia - Via Centrale Umbra - Exit from the E45: Spello - follow the signs. 400 meters from the historic center. Info and reservations: Polisportiva Julia +39 0742-652676 Rest area mainly paved and illuminated (about 300 camper places). Adjacent camper service: Porta Consolare, entrance to the historic center. Info: VV. UU. tel. +39 0742.651221> Water, cockpit. ü Two Info Points will be set up at Spello's main access points. The Guide to the Infiorate and Spello will be available at the reception points, along with numerous gadgets for sale, and will be distributed to the car parks. Pro Loco IAT Spello: piazza Matteotti 3; tel. 0742-301009; info@prospello.it; www.prospello.it | Open every day from 9.30 to 12.30 and from 3.30 to 17.30 and on Saturday the infiorata until late at night. Info Point System Museum: via Tempio di Diana 9; tel. 0742-302239 spello@sistemamuseo.it; www.sistemamuseo.it; open from Tuesday to Sunday 9 am-1pm (April-September). Booking routes and guided tours. Not to be missed in the historic center of Spello a visit to the Palazzo Comunale (Piazza Repubblica), which houses the library of the Fondo Antico, the Rescritto di Costantino and the permanent exhibition of Emilio Greco, and the Museo delle Infiorate (Piazza Repubblica), home of the exhibition of sketches and historical photographic exhibition of the most rooted artistic tradition in the spellan community: the artistic infiorate of Corpus Domini. Going up from Piazza della Repubblica you can reach the Roman Arch and the panoramic lookout, while going down along Corso Cavour, among small shops of typical local products, wine bars, restaurants and flowery alleys, you can find the Church of Sant'Andrea, the Palazzo dei Canonici , home of the Civic Art Gallery, and the Church of Santa Maria Maggiore (Piazza Matteotti), which houses one of the most famous frescoes of Pintoricchio (Cappella Baglioni or Cappella Bella) as well as works by Perugino, Cola Petruccioli and the Alunno. Corso Cavour then joins the Via Consolare, which leads to what was the main access to the ancient city, namely the Porta Consolare, the subject of numerous archaeological excavations until a few years ago. Just outside the urban walls of great interest is the Villa dei Mosaici di Spello, a residence that dates back to the era of imperial Rome, casually discovered in 2005 in Sant'Anna, today housed in a modern museum inaugurated in March 2018. In the direction of Foligno the Fondazione Barbanera 1762 (a historical archive with over 50 thousand ancient documents including 3 thousand almanacs, calendars and lunar from all over the world) and the Garden of Seasons and rare seeds (signed by landscape architect Peter Curzon, with seeds and rare or endangered vegetables, arboreal arboreal fruits, flowers and officinal herbs), which are located in the rural complex where the publishing house is located, which for over two and a half centuries has printed the most famous and long-lived almanac d 'Italy. On the other hand, along the road of Porta Venere towards Assisi, the remains of a Roman amphitheater from the glorious period of Colonia Julia (1st century AD), place of medieval duels, shows, pilgrimages and fairs (at least until the 18th century) are worth a visit. the park-museum of Villa Fidelia (XVI century), where the Straka-Coppa family collection is housed with works from the end of the 19th century to the present day. Comunicazione e Ufficio stampa Associazione Le Infiorate di Spello: TGC Eventi S.r.l. When is the best time 2nd or 3rd June to visit? If you want to see preparation of event 2nd is better than 3rd. On Sunday ther will be the floer carpet ready and the big procession. I suppose Spello will be full of people and really colorfull too.